Centerfire rifle bullets differ in construction from handgun bullets in that rifle bullets have to have either full or partial metal jacketing. This is necessary because of the high velocities at which rifle bullets are propelled down a barrel. If the bullets were lead or lead alloy, these high velocities would result in the lead being stripped from the surface of the bullet by the rifling grooves. Some handloaders will load centerfire rifle cartridges with cast lead bullets. In such cases, however, they reduce the powder charge so that the muzzle velocities produced are generally below 2000 ft/sec. These bullets may or may not have a gas check. They are easily recognized by their long length and deep cannelures for lubricants (Figure 7.1). Figure 7.1 Cast rifle bullet with deep cannelures filled with grease. 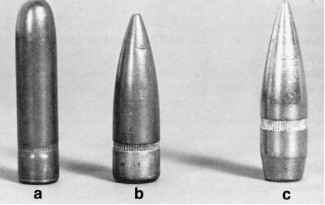 Figure 7.2 Full metal-jacketed military bullets. (a) 162-gr. roundnose; (b) 150-gr. Spitzer, (c) 150-gr. boat-tail. has a lead or steel core, covered by a jacket of cupro-nickel, gilding metal or steel. The jacket encloses the tip of the bullet, preventing it from expanding when it reaches its target. The tip may be either pointed or rounded (Figure 7.2). The core is exposed at the base. Some rifle cartridges are loaded with bullets whose core is made up of both mild steel and lead. The standard AK-47 military round produced in Russia and China has a mild-steel core, sheathed in lead, at the rear, with a small lead tip in front; the M-855 M-16A2 bullet, a small mild-steel core in front and a lead core in the rear. Soft-point rifle bullets have a lead core with a partial metal jacketing that is generally closed at the base (Figure 7.3). The lead core is exposed at the tip so as to facilitate expansion when the bullet strikes. The tip of the soft-point bullet may either taper to a point or have a rounded, blunt end. Expansion of soft-point bullets can be facilitated further by scalloping the mouth of the jacket or cutting five or six notches around the jacket mouth. These modification allow uniform peel-back of the jacket when the bullet strikes the target. Soft-point bullets are the most widely used form of hunting ammunition. One variant of soft-point bullets is the Nosler Partition® bullet. Here the jacket is "H" shaped such that the lead core is in two segments, one above and the other below the horizontal bar of the "H". Thus, the bullet has an exposed lead tip and an exposed lead base. Federal makes a soft point bullet with the usual copper jacket and lead core but with a solid copper base. PMC makes a cartridge loaded with a solid copper bullet. Figure 7.3 Hunting bullets. (a) Bronze-point, (b) Silvertip®, (c) soft -point, (d) soft-point, and (e) hollow-point. tip of the bullet to facilitate expansion when the bullet strikes game (Figure 7.3). Hollow-point bullets are used for hunting and competitive shooting matches. Winchester® makes a rifle bullet, the Fail Safe®, that has a solid copper-alloy front section, with a notched hollow-point cavity, and a solid rear lead core, partially sheathed in a steel insert. The base of the bullet is closed with a brass heel closure disk. The surface of the bullet is black due to a baked on molybdenum disulfide coating; the cartridge case is nickel plated. The fourth category of rifle bullets is a miscellaneous one of controlled expansion projectiles. All are variants of soft-point bullets. This group includes Silver-Tip® ammunition by Winchester; the Bronze-Point® by Remington and the Nosler Ballistic Tip® bullets. The Silver-Tip® bullet is a soft-point bullet whose lead tip is protected by a thin jacket of aluminum alloy (Figure 7.3). This aluminum sheath extends back under the jacket almost to the cannelure. The purpose of the aluminum jacket is to protect the exposed lead core so as to delay expansion slightly. The Remington Bronze-Point® has a pointed, wedge-shaped nose inserted in the forward part of the lead core. This "bronze-point" projects out the tip of the bullet jacket. A small cavity underlies this wedge. When the bullet strikes the target, the wedge is driven back into the bullet, expanding it. Figure 7.4 is an x-ray of an individual shot in the head with this type of ammunition. Note the presence of the "bronze point." Figure 7.4 X-ray of individual shot in head with Bronze-Point® bullet; arrowlike "Bronze-Point" in center of bullet fragments. Figure 7.5 Nosler Ballistic Tip®. Winchester, Remington, and Federal manufacture bullets with Nosler polycarbonate or similar tips. From this discussion, we can see that hunting bullets differ from military bullets in that the former are designed to expand or mushroom so as to transfer energy more efficiently to the target and to kill game more effectively. Ammunition manufacturers control the rate and extent of expansion of hunting ammunition by controlling the bullet velocity and the physical characteristics of the bullet. 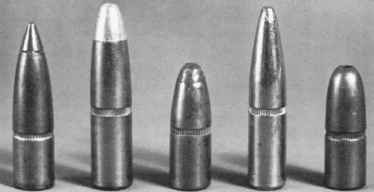 Thus, the degree of expansion can be controlled by the thickness and hardness of the jacket, the location of the bullet cannelure, the amount of lead exposed, the shape of the bullet, the composition of the lead core (antimony is often added to the lead), and the design characteristic of the bullet. Military bullets, by virtue of their full metal jackets, tend to pass through the body intact, thus producing less extensive injuries than hunting ammunition. Military bullets usually do not fragment in the body or shed fragments of lead in their paths. Because of the high velocity of such military rounds as well as their tough construction, it is possible for such bullets to pass through more than one individual before coming to rest. These bullets may be almost virginal in appearance after recovery from the body. One notable exception to the aforementioned observations in regard to bullet breakup in full metal-jacketed bullets is the 5.56 x 45-mm (.223) cartridge. As originally loaded with a 55-gr. bullet and used in the original AR-15 and the M-16A1, this particular cartridge gained widespread notoriety in both the lay press and the medical literature in that the wounds inflicted often were described as "explosive" in nature. The 55-gr. 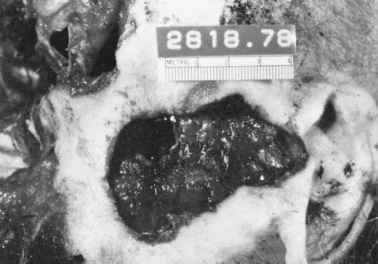 bullet has been described as "exploding" in the body. Such statements are, of course, nonsense. The bullet does not explode in the body; it does, however, have a tendency to rapidly destabilize, bending at the cannelure, resulting in lead core being "squirted" out the base. Because of these characteristics, this cartridge tends to lose considerable amounts of kinetic energy, thus producing relatively severe wounds for the amount of kinetic energy that it possesses. The wounds produced by this round are, in fact, less severe than those produced by lower velocity hunting ammunition such as the .30-30. When full metal-jacketed 55 gr. 5.56-mm bullets break up in the body, the tip of the bullet tends to break off at the cannelure with the tip remaining relatively intact, while the lead core and the rest of the jacket shred (Figure 7.6 A-B). The triangular shape of the tip of the bullet often can be seen on x-ray. The M-193 (55 gr.) version of the 5.56 X 45 mm cartridge has been replaced in U.S. military service with the M-885 cartridge. This is loaded with a 62-gr. bullet. The bullet has a compound steel/lead core with a small mild steel core in front of a larger lead core. Just like the 55-gr. bullet, the 62-gr. bullet begins to yaw widely shortly after entering the body. 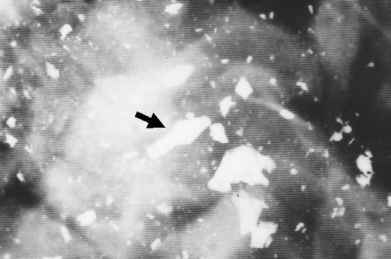 The bullet tends to break at the cannelure resulting in loss of lead core (a "lead snowstorm"); a relatively intact triangular tip and the residual copper jacketing (Figure 7.6 C-D).